Lack of Advocacy: The Need for CBF to Adopt A Statement Of Affirmation For Those With Disabilities. In the Fall 2017 semester, while taking a theology course offered at Wake Divinity by Dr. Voss Roberts, I encountered a lack of affirming language and practices within my own denomination, the Cooperative Baptist Fellowship, concerning those within our faith communities who possess varying disabilities. This self-awareness led to many discussions with those in CBF life both on the state and national level. This post chronicles some of my journey and discovery by engaging the presentation and facilitation of dialogue held around the topic at CBFNC’s Annual Gathering which took place at Knollwood Baptist Church March 16th, 2018. This post represents my reflection in dealing with and processing of what came out of that conversation with fellow ministers I asked to participate in this endeavor with me. I decided to turn my interest into an independent study this semester with Dr. Voss Roberts who encouraged me of its importance. Early on I began to struggle with the idea of presenting. I felt it was somewhat inauthentic of me to present myself as any sort of authority on the issue. Instead, after an additional meeting with Dr. Voss Roberts, I decided to own that fact and worked it into my presentation. Another resource I wanted to tap into was different denominational perspectives. I didn’t offer a structured panel discussion, but I asked four different faith leaders to join me that afternoon and share their stories and experiences. I included several research statements from other Baptist organizations and provided entry-level language in addressing the issue. I also included some statistics on the subject as well. My hope in doing this was to “cast a wide net”, appealing to those who zoom in on numbers as well as those who are drawn to more personal anecdotes. I started out my presentation thanking all that came. Sixteen was the headcount I took when it began. I believe it’s important to point out the age demographic; 75% of those who attended appeared to be Millennials or Generation X while the remaining few were Baby-boomers. After the welcome, I jumped into the PowerPoint and laid out three questions I wanted to answer: Who I was? How I ended up here? Who am I not? These questions laid the groundwork for letting the room know who was speaking to them. I explained my role as an ordained clergy in a CBF church in Statesville, NC. I told them I was a 2nd-year divinity student at Wake Forest University and it was during a course I had taken which prompted me to start asking questions as to why CBF had no official statement affirming those with disabilities. Lastly, I told them I was not an exhaustive voice when it came to this important discussion. I was no expert on the subject; rather I was just a person trying to figure out more about this issue by asking questions in hopes to start a dialogue which leads to action. 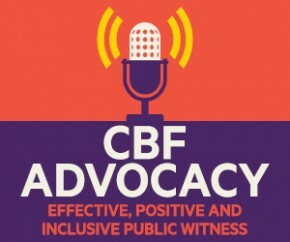 I included pictures and links of CBF web pages being sure to point out the “advocacy” page on CBF’s national site, www.cbf.net, one that did not mention those with disabilities. I then brought up statements, both full and partial, from the American Baptist Church and Southern Baptist Convention addressing the same issue. My conclusion of this information was CBF could not claim local autonomy, the local church’s right to govern itself, as the culprit for the lack of engagement around the topic. I wanted to point out as well the statements by other Baptist denominations were nothing new. The SBC statement originated in 1978 and American Baptist Churches had gone through several revisions of their own statement, the latest being 2002. I also wanted to be clear about this problem's impact on more than just Baptist. I invited four speakers to share their stories that day. Wes Pitts is the Minister of Education at First Presbyterian Church in Statesville. Carrilea Hall is the Associate Minister at Broad Street United Methodist Church in Statesville. I know both of these wonderful individuals from serving in the same community as them. Wes’s church host a weekly time and space for those with disabilities and Carrilea’s church partners with Camp Barnabas, a camp for those with disabilities, for the last several years. I also invited Shakeisha Grey from the divinity school at WFU. Her experience as a chaplain and perspective as a candidate in the UUA I believed would be appreciated and insightful. Anita Laffoon is the Minister of Church Life at First Baptist Church – Kernersville, NC. Anita’s church has created space for those with disabilities and has been practicing and redefining their methods for many years. Because the session only lasted an hour, I notified my speakers than 5-7 minutes a piece would the allotted amount of time I could give them to answer two questions. The first, what was their respected denomination's stance on affirming persons with either mental or physical disabilities? The second, a personal story or reflection indicating their role as an advocate, ally, or activist for someone who has a disability. I made sure to include statistics of why this should matter to those in our congregations and began unpacking some of the language those attending would need to familiarize themselves with; such as the concept of ableism and the difference between disabilities and handicaps. This was done to help show how important language is around this topic and its impact of helping faith communities make positive steps forward in a much-needed discussion. I used a quote Nancy Eiesland and found myself referencing her book The Disabled God quite a few times. My intent of using Eiesland was to provoke the idea of encountering, experiencing or seeing God in a new way. I then showed a few works of art which suggested this, Whirlwheel by Olivia Wise and The Disabled God at the University of Stellenbosch. I even used an example of a more inclusive liturgy with a congregational response (if time permitted, I would have asked us as a group to read this aloud to one another). Finally, I showed some diagrams suggesting different approaches to worship spaces which would be accessible to those with disabilities and other adjustments that would need to be considered for full inclusion such as pew placement, lecterns and microphone accessibility, adequate lighting for those that read lips, etc…I showed images of Salvage Garden in Greensboro, NC and spoke of Jean Vanier and the L’Arche communities as tangible inclusive spaces. Weeks later I made it a point to go back and speak with the other ministers who joined me that day to see if they had picked up on any other themes I might have missed. I asked several questions of them including how they felt the presentation went and was there anything not discussed or something they wished was discussed in more detail. The feedback I received was helpful and affirming of the need for this discussion to take place. Wes Pitts informed me that the presentation and the other speakers I brought in were “thought-provoking.” However, he saw the hour-long time frame as too constrictive for any deep conversation to occur. He related to me, “I thought it did a good job of hitting on multiple topics and getting people to think deeply about their own or their denomination's approach to disability.” When speaking to Wes I got the impression he picked up on the theme I sensed as well dealing with how we began to cultivate space and shift congregational awareness. When I asked him what he thought of those that attended the event he said, “I was disappointed, but not surprised, that there was low attendance. It speaks to the church's engagement of disability care/welcome more broadly. Those that were there seemed to be deeply engaged and promoted healthy dialogue and asked good questions.” Anita Laffoon echoed some of Wes’s statements, but also added she appreciated something he had said during his talk about the Presbyterian Church and their idea of worship. “I was fascinated with the Presbyterian order that says that a service can only be considered worship if all are able to attend. I would love to delve into that and see what it looks like on a practical level in Baptist life.” Anita was the other fellow CBF minister in the group besides me. Her being there and familiarity with CBF life and what takes place at these types of gatherings was insightful. She was there the entire weekend and personally told me she enjoyed our session the best. When talking about the other sessions she visited that weekend she added, “Yours was challenging and I liked that.” Where Wes picked up on the size of the group being an indication of an apparent lack of empathy for those with disabilities, Anita enjoyed the smaller size and noticed the conversation morphing into something bigger. “I noticed that every time we focused on one particular group with its unique challenges someone invited us to consider another group with different challenges. I loved how being inclusive to a small group was ballooning into being inclusive of all,” she said. Shakeisha Gray too thought the time frame was too short and wished we, “could have spoken a bit more about what their denominational policies are and if they see people with disabilities serving in ministerial and leadership capacities, not just as members of their congregations. If we aren't seeing people with disabilities in these roles, then we aren't doing ministry right! It helps foster and support people with disabilities exemplify how they are capable of leadership and service.” When I asked her about a vibe or theme she noticed from those who attended she said, “The vibe was definitely laid back, but the audience didn't engage as much as I hoped they would, although I saw some people nod, no one really asked questions, which is unfortunate because I know the amount of work that went into the presentation and the amount of knowledge that was in the room. However, it could also be that those interested in this topic, are already doing this kind of work. It did come up that our respective denominations are all trying, in their own ways, to be more supportive of those with disabilities.” This point was well taken as afterward when I was speaking to a gentleman who attended the session he informed me that his son has a disability and the reason he attends Knollwood Baptist is because of their willingness to include his son in their congregation. I can't say enough how much I appreciate Shakeisha being there as a person who has a disability herself, her story and her presence was crucial to the conversation. This process was both fulfilling and taxing at the same time. I often found myself becoming hopeful and frustrated. When it comes to change within a faith community it appears a minority are intrigued enough to support said change, but others seemed to push back with a resisting “why?” I don’t know if I want to label those who do this as selfish, but I believe their lack of exposure to the issue prevents them from seeing why a change is needed. I believe CBF as a whole needs to adopt a statement and resources advocating for those with disabilities, I confess I’m a little jaded with how they, and institutional bodies in general, are slow moving dinosaurs when it comes to change. I know that I can continue to bring this issue up at both the state and national level, but see my best chance at achieving this at the local level within my own church. If a sustainable, dare I say thriving model, could be achieved on such level it would be hard to be overlooked by the powers that be. I believe it will take our story being partnered with other church’s stories for change to occur. The Longest Table: A Community Engages One Another. Eco-Priest? A Clergy's Response to the Anthropocene.